Impressive mature trees, tennis court, equestrian arena, fenced paddocks, out buildings all located on prestigious Slopehill Road. A beautifully renovated 1870's stone cottage sits adjacent to the main four bedroom three bathroom home. This 2.8 hectare (6.7 acre) rural property is just ten minutes from Queenstown International Airport and Queenstown's main shopping hub and has spectacular views to Coronet Peak, Queenstown Hill, the Crown Range and the Remarkables mountains. The main house has been renovated and extended to give a large open-plan kitchen and living area and the master wing leads to the north-facing deck and outdoor entertaining area. There are three further bedrooms one with an en-suite, family bathroom, walk-in pantry and office as well as an outdoor boot room and bathroom. Outbuildings include a large garage and workshop with four car garaging and two stables, a hay shed and a large tack room beside the concrete wash down bay and 30 x 60 m sand equestrian arena. There are also four large paddocks, a raised vegetable garden and carport. Potable water is from a private bore and the property is also connected to the Arrow Irrigation Scheme. 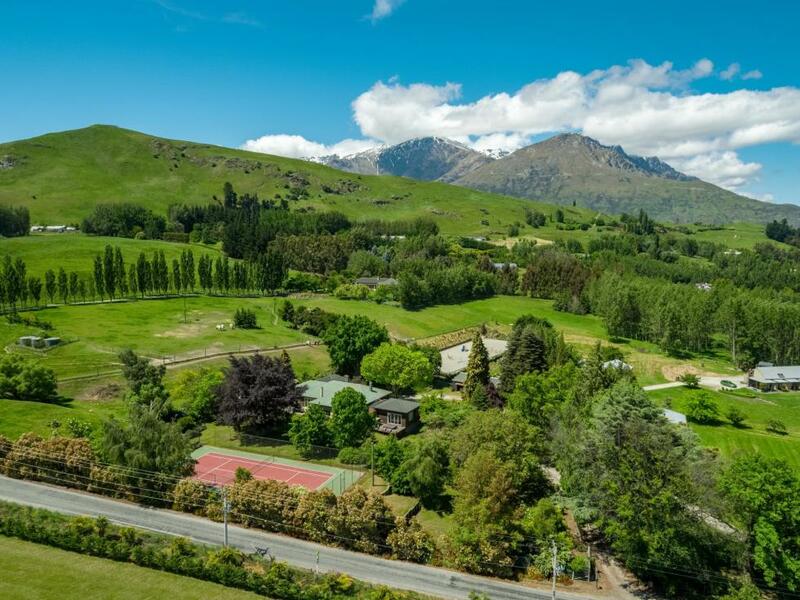 If you are searching for the good life in that unique Queenstown country property with excellent year-round sunshine, tranquility, privacy, mature grounds and an address your friends will be envious of, this is worth your consideration.